Samsung obtained the top spot among smartphone vendors, according to the latest quarterly report from the International Data Corporation. The IDC report on worldwide mobile phone markets found that Samsung shipped more smartphones than any other vendor during 2012's first quarter with 42.2 million units. And, the aggressive shipping paid off, earning the manufacturer a 29.1 percent market share. Samsung appears to be the only Android vendor among the top five manufacturers on the upturn, with HTC down due to slow performance in the U.S.
HTC ranked fifth in the top five, controlling 4.8 percent of the total smartphone market. Nokia and RIM are also down compared to last year's first quarter, earning 8.2 percent and 6.7 percent market share respectively. However, with Nokia transitioning to Windows Phone and BlackBerry 10 to RIM, the hope is that a weak first quarter will be overshadowed as production increases on their new platforms. Apple, on the other hand, is still riding a wave of success despite slipping behind Samsung to second place. Apple boasted 35.1 million units shipped for the first quarter, with 24.2 percent of the smartphone market share. "The race between Apple and Samsung remained tight during the quarter, even as both companies posted growth in key areas," IDC senior research analyst Ramon Llamas said. "Apple launched its popular iPhone 4S in additional key markets, most notably in China, and Samsung experienced continued success from its Galaxy Note smartphone/tablet and other Galaxy smartphones." "With other companies in the midst of major strategic transitions, the contest between Apple and Samsung will bear close observation as hotly-anticipated new models are launched." The IDC also reports that Samsung rose to oust Nokia from the top spot among overall mobile phone vendors, including non-smartphones. Nokia has historically been the global leader for total phones shipped since 2004, but fell due to lower demand in China coupled with the company's smartphone difficulties. 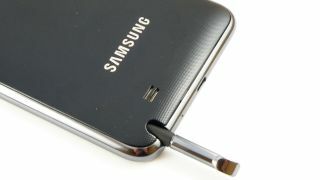 Samsung, however, stepped up in large part due to its smartphone success.